Did you know that fireworks are illegal in Downers Grove and in Illinois? The Downers Grove Municipal Code mirrors that of the Illinois State Fireworks Code, which means that firecrackers, bottle rockets, cherry bombs, and the like are prohibited. Though one can easily purchase fireworks legally in adjacent states, it is illegal to bring them home across the border. Any person convicted of an offense shall be subject to a fine of between $75.00 and $750.00. Legal firework novelties such as sparklers, fountains, snakes, party poppers, and ground spinners, marketed as "safe," still possess dangers. About one quarter of emergency room, fireworks injuries occur from July 2 to July 5. The risk of fireworks injury is more than twice as high for children ages 10-14 as for the general population. 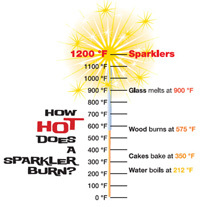 Children as young as 2 years old are commonly handed sparklers which reach temperatures of 1,200 to 1,800 degrees, hot enough to cause third-degree burns, yet adults underestimate the dangers. For a July 4 that's both exciting and safe, leave the fireworks to the experts and take the family to a professional outdoor display.